How to translate your Scouting skills to the language of employers? 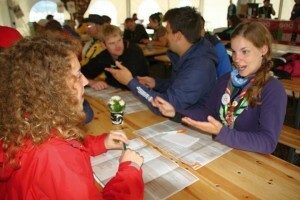 Volunteering > How to translate your Scouting skills to the language of employers? Have you ever thought about what skills you are developing as a volunteer in Scouting? Did you experience a job interview where a potential employer asked you about your experience acquired outside of school? Did you try to make a match between official requirements for a job and your volunteer experience? French Scouts and Guides did – and developed a tool called “Valorise-toi!“, which was later translated into English as “Empower yourself!” and a series of workshops was run at the WSJ 2011 in Sweden on this topic. It aims at helping you to realize how good you are in different situations encountered in Scouting environment and how to translate this experience into the language of employers, thus enabling you to increase your chances on the labour market – by performing better during the job interviews, letters of intent etc. Besides that, the material helps with starting to design your personal development plan. The Volunteering Working Group of the European Scout Region is ready to promote the Empower yourself! tool during various events. Why not to try it yourself or to organize a workshop in your association? So far English, Czech and Spanish translations are in use and others in preparation. After the permission of Scouts et Guides de France (see the contact in the workshop description above) you can even use the same layout, in InDesign program, prepared by Czech scouts. Good luck in self-discoveries and with the job interviews! Pavel comes from the Czech Republic and is the co-ordinator of Region's Volunteering Working Group. One Response to How to translate your Scouting skills to the language of employers?